Tried with and without --enable-qt option when compiling. Both give the same result. Here's how it looks like. At the bottom is Rhythmbox, Audacious use light version of the icons. I'm using Linux Mint 18.3. Icon theme is Papirus. 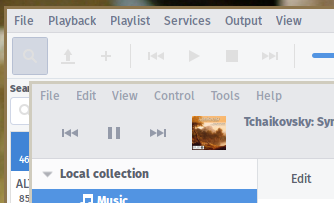 Check your icon theme settings for the various toolkits (GTK2, GTK3, Qt 5). Playing with lxappearance and qt5 settings give me a working combinations. Thanks, John!